Whether disposing of a single zombie or competing in an event, throwing knives are a vital tool that could save your life! 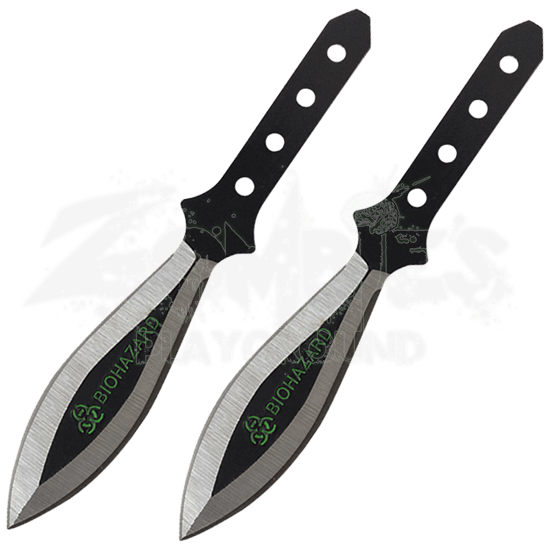 Go from novice to pro by learning all the tricks with the 2 Piece Biohazard Black Leaf Blade Throwing Knives! Crafted from durable 440 stainless steel, this pair of throwing knives provide a unique balance that virtually anyone can handle with enough practice! The unconventional design shifts the weight from its traditional position in the center toward the tip of the blade, the circular cutouts in the handle adding to this distribution. When thrown, the weight distribution will bring the weight and force toward the point, making it the ideal tool for training and survival situations. The sleek black finish on the handle emphasizes the vibrant green of the iconic biohazard symbol engraved on the blade. Set the blades in their nylon sheath that is equally as durable for a quick, easy, and safe way to carry your survival tools with you! 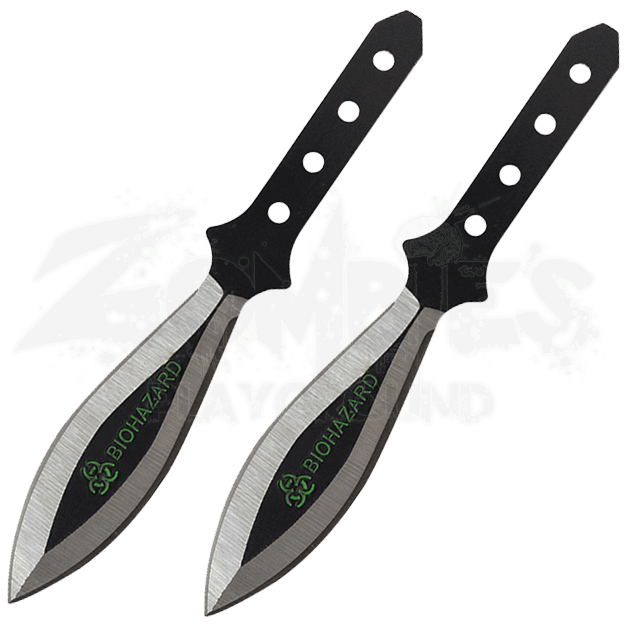 Whether smoking the competition or slaying an enraged zombie, the 2 Piece Biohazard Black Leaf Blade Throwing Knives are sure to take you to new levels of expertise if you set your mind to it!